The Weaubleau impact structure “round rocks” (“Missouri rock balls”, “Weaubleau eggs”): possible analogues in the Spanish Azuara/Rubielos de la Cérida impact structures. Abstract. – The “round rocks” of the Weaubleau-Osceola impact structure have phenomenological counterparts in the Spanish Azuara/Rubielos de la Cérida impact structures where they occur within voluminous heavily brecciated rock units. Related nodular bodies within large monomictic movement breccias are observed also in the Ries impact structure. 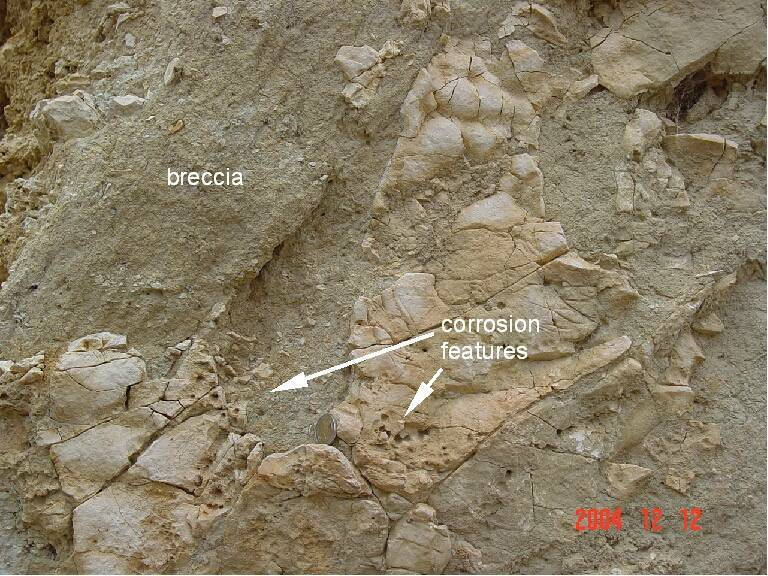 A process similar to the formation of monomictic impact breccias with rounded clasts as part of a mortar texture is suggested. 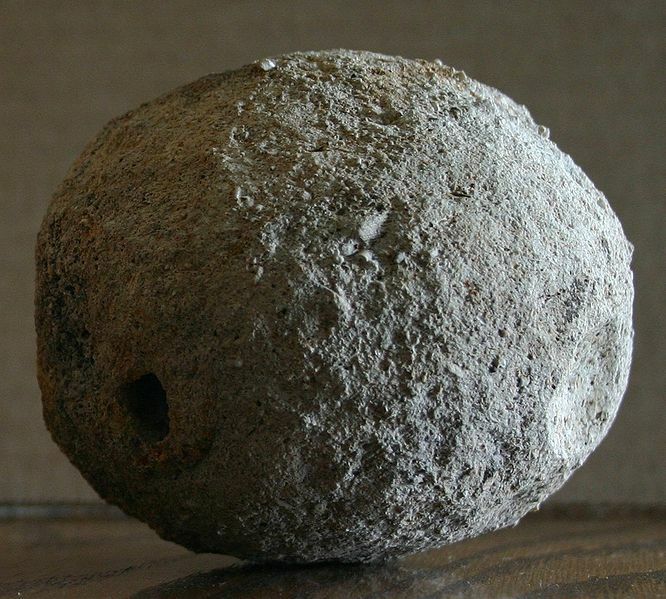 A relation to the Weaubleau-Osceola “round rocks” may exist but not necessarily. The Weaubleau (or now Weaubleau-Osceola) circular feature in southwestern Missouri is a 19 km-diameter impact structure that formed in the Mid-Carboniferous about 330 million years ago (Evans et al. 2003). A peculiar feature clearly restricted to and common throughout the Weaubleau structure are the “round rocks” called also “Missouri rock balls” or “Weaubleau eggs” (Figs. 1, 2). Originally considered to be of glacial origin they are in general attributed now to the impact event. The idea of a formation as mega-accrecionary lapilli has been discarded and a diagenetic formation from blasted siltstone clasts intermixed in the fallback breccia and subsequent silification is mostly discussed. Nonetheless, the process of formation is still poorly understood. 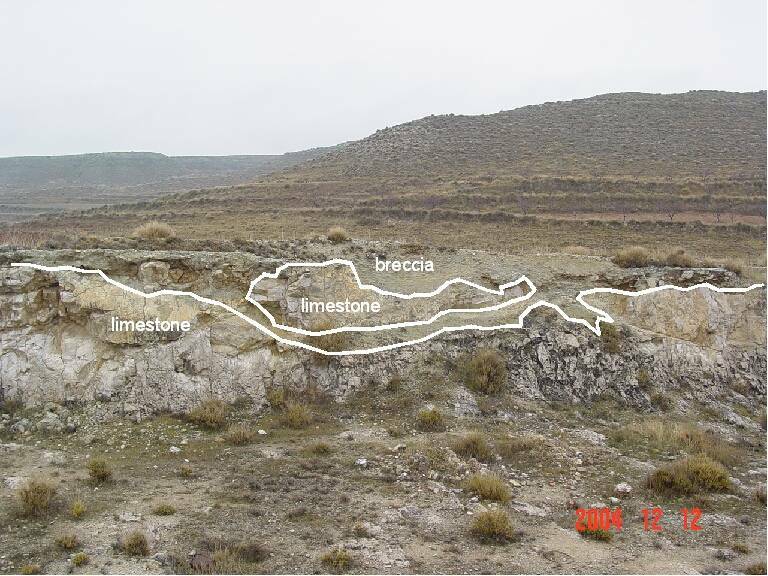 Here, we present evidence of roughly similar nodules occurring in the Spanish large Azuara and Rubielos de la Cérida impact structures where different from the Weaubleau “round rocks” they can be observed how they developed in situ. Fig. 1. Weaubleau “round rock”. The typical and most common size runs from golf-balls to grapefruit. Photo: Harmil, WIKIMEDIA COMMONS. In 2012 in the course of a field trip around the Moneva reservoir (Fig. 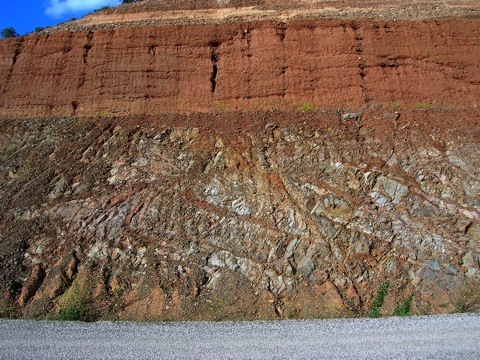 1, 2) one of the authors, Daniel Gorgas from Azuara who already in the past had frequently contributed important geologic observations to the Azuara impact research, came across a geologic setting that appeared to drastically deviate from the “normal” deposits well known to him as the extended young Tertiary sediments within the Azuara structure. Following his report we began to study the geological maps of the area around the reservoir (Fig. 2, 3) and then to investigate the outcrops in more detail. 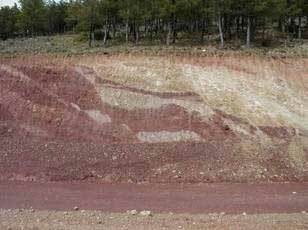 The investigation of the Azuara and Rubielos large impact structures now lasts about 30 years. Since the early eighties of the last century we have produced abundant and very exciting evidence for this unique geological scenario on the Iberian peninsula – despite much bitter opposition from various sides, persons and for various motives, which can be looked up elsewhere on this website. Much of our geological and petrographical material is being presented here in the web, but it is only part of an accumulation many times greater. 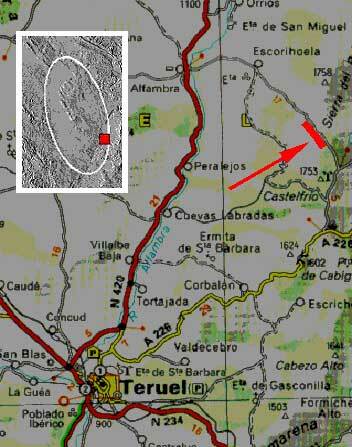 Therefore we have decided to add little by little to the complex of the Azuara and Rubielos de la Cérida impact geology, and we don’t give up hope that a few more geologists become motivated to visit this extraordinary meteorite impact ensemble of some 120 km length. We begin with an outcrop scenario easily accessible roadside at the village of Moyuela in the middle of the Azuara structure (Fig. 1) typically showing the enormous destruction the impact exerted on the well-bedded Jurassic limestones, which is inexplicable by normal Alpidic tectonics. Shocked quartzite cobbles making up widely spread Triassic Buntsandstein conglomerates in Northern Spain have been reported (Ernstson et al. 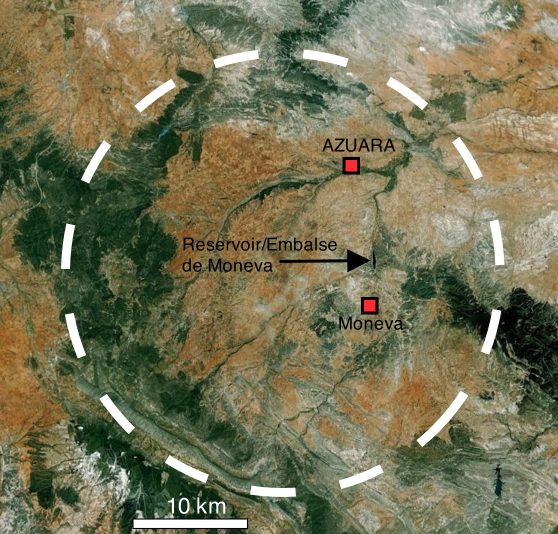 1999, 2001) to be related to the Mid-Tertiary large Azuara multiple impact event with the formation of the Azuara impact structure and the Rubielos de la Cérida elongated impact basin (Hradil et al. 2001, Ernstson et al. 2001, 2002, Schüssler et al. 2002, Claudin & Ernstson 2003, Ernstson et al. 2003). The quartzite cobbles (and boulders) are peculiarly and intensively pockmarked and cratered (Figs. 1, 2) and show in general a closely spaced subparallel fracturing (Fig. 3). The cobbles’ characteristics become especially evident when they are found scattered in the field as a result of the conglomerate weathering (Fig. 4). Fig. 1. Typically pockmarked, cratered and polished (the large boulder) quartzite cobbles and boulders from the Triassic Buntsandstein conglomerates. Earthquakes and meteorite craters: Rock liquefaction phenomena and the Chiemgau impact. The impact of cosmic bodies to produce large impact craters is related with the propagation of seismic waves which may release energies comparable to strongest earthquakes, and even beyond that. It is obvious that similar processes and well-known drastic deformations may result in the ground and at the earth’s surface. In this context, W. Alvarez and coauthors (Alvarez W., Staley E., O’Connor D., Chan M.A., Synsedimentary deformation in the Jurassic of south-eastern Utah, a case of impact shaking? 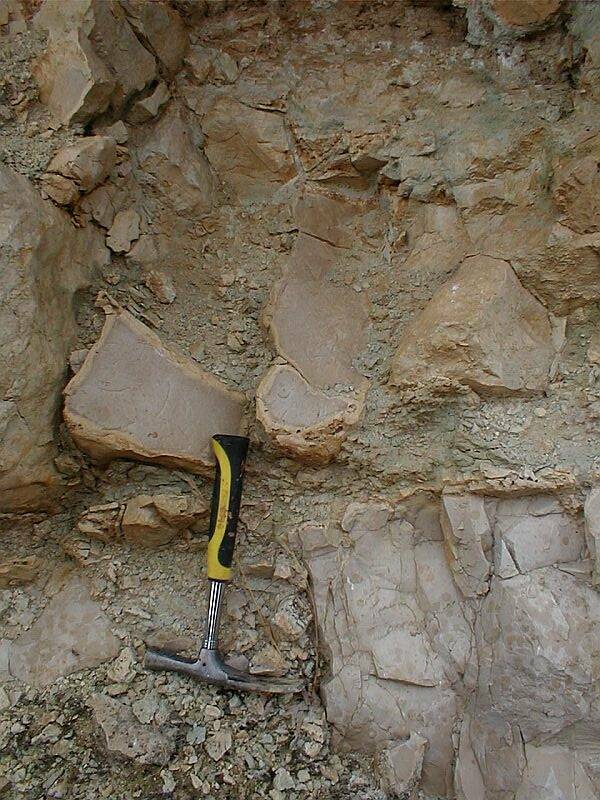 Geology, 1998, 26, 579-582) went into an interesting question when they related characteristic deformations in exposed older geological layers with a possible meteorite impact in a past geologic epoch thus pointing to the Upheaval Dome impact structure (Utah, USA) and distant rock liquefaction phenomena. 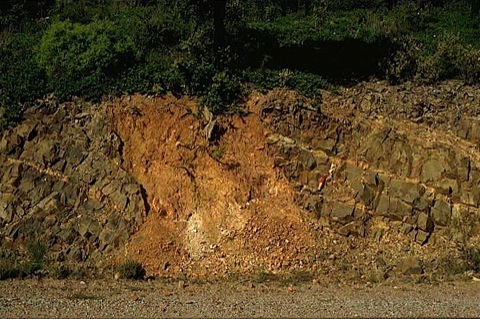 Rock liquefaction is an established process during strong earthquakes which can lead to enormous modifications of the earth’s surface and catastrophic damage when the seismic shock affects water-saturated uncemented rocks. 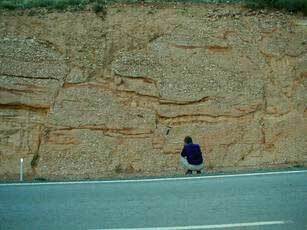 For the study of earlier earthquakes in the geologic past (paleoseismicity), observations in older layers may be important, and Alvarez had now pointed to the possibility that fossil sedimentary liquefaction features need not necessarily have originated from earthquakes but may be related with former large impact events. 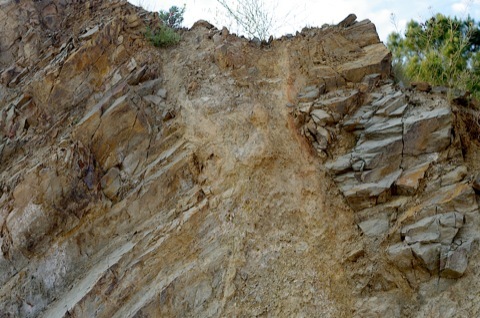 A critical debate, however, submitted that in the special case such a context of the relatively small 6 km-diameter Upheaval Dome impact structure and the geological outcrop some 260 km apart must be questioned. describes the first geologic and geophysical investigations of the so-called “Thunderhole” (in German: Donnerloch) phenomenon in the region of the town of Kienberg north of Lake Chiemsee in Southeast Bavaria (Germany). Fig. 1. A freshly caved-in and a somewhat older thunderhole near the town of Kienberg north of Lake Chiemsee. Strikingly different from customary and well known sink holes e.g. in karst areas, the thunderholes exhibit a highly energetic rock mass transport from the bottom up before collapse, which is typical for liquefaction processes. The authors conclude that the innumerable enigmatic sudden sinkhole cave-ins having happened in living memory originate from late and even today acting processes of an earlier shock-induced underground rock liquefaction known from strong earthquake shocks. 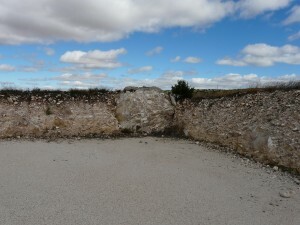 The geologically prominent underground structures that have now been uncovered are considered the result of impact shocks in the course of the formation of the Chiemgau meteorite crater strewn field (Chiemgau impact), and a comparison is made with the famous widespread and strong rock liquefaction features in the large region affected by the catastrophic 1811/1812 New Madrid (Missouri) earthquake series. Kord Ernstson & Andreas Neumair: Geoelectric Complex Resistivity Measurements of Soil Liquefaction Features in Quaternary Sediments of the Alpine Foreland, Germany. – AGU Fall Meeting, December 5-9, 2011, NS23A-1555. The poster may be clicked here. Fig. 2. From the geophysical investigation of the impact-induced thunderholes in the Chiemgau impact event. 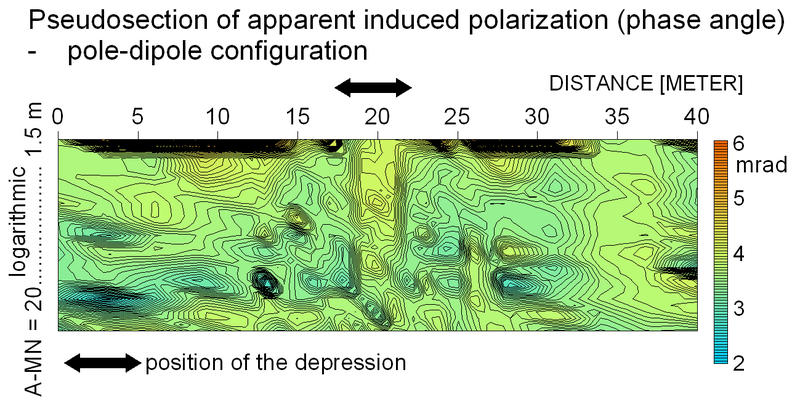 The geoelectrical measurements of induced polarization on a profile across an active depression as a precursor of a future thunderhole reveal perfectly clear the intrusion paths bottom up as a document of impact liquefaction. Breccia dikes (dike breccias) are a prominent feature in impact structures, and they have told us a good many about the processes of impact cratering. Among the yet known roughly 200 terrestrial impact structures, Azuara and Rubielos de la Cérida are providing the probably by far best insight into these fascinating geological configurations concerning abundance, exposure accessibility, and diversity with regard to geometry, dimensions and material (also see breccia/dikes; http://www.impact-structures.com/spain; rubielos-breccia-dikes). 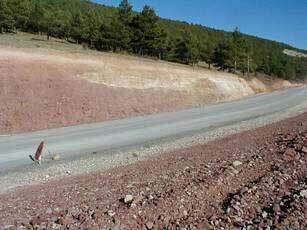 Recent extensive construction works (storage reservoir, freeway, railroad) near Lechago, Calamocha (CAL; see Fig. 1, red circle) have yielded quite a few nice geological exposures once more documenting the almost everywhere existing impact signature thus underlining that construction work in the large impact region of the Azuara and Rubielos de la Cérida structures may be a hard undertaking – as was impressively shown when the new Autovía freeway line had to cut through the strongly destroyed Paleozoic of the Iberian Chain in the northern rim zone of the Azuara impact structure between Daroca and Cariñena (click here http://www.impact-structures.com/impact-spain/the-azuara-impact-structure/the-2005-autovia-mudejar-geological-exposures/ “The 2005 Autovía Mudéjar geological exposures”). Below we show images of some newly exposed impact breccia dikes near Lechago exhibiting their characteristic properties and, for comparison, similar dikes and dike systems from the companion Azuara impact structure (location in Fig. 1). Focusing here on breccia dikes in Paleozoic silicate rocks bears in mind the frequent claim of some Spanish geologists, especially from the Zaragoza university, that the impact breccia dikes are all karst phenomena. Their confusion of breccia dikes with karst features, however, meets some difficulties in the case of silicate siltstones. Also fault breccias can clearly be excluded since these dikes are filled with allochthonous material as is typical for impact-induced highly energetic injection processes. Fig. 3. 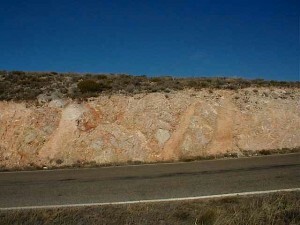 For comparison: impact breccia dike in Paleozoic siltstones; road to Santuario de la Virgen de Herrera (1 in Fig. 1). Azuara impact structure. Fig. 4. For comparison: thick impact breccia dikes cutting roughly perpendicular through the bedding of the Paleozoic siltstones. Autovía Mudéjar in course of construction; near Cariñena (2 in Fig. 1). Azuara impact structure. Fig. 5. Large system of impact breccia dikes in Paleozoic siltstones at the new storage reservoir near Lechago. 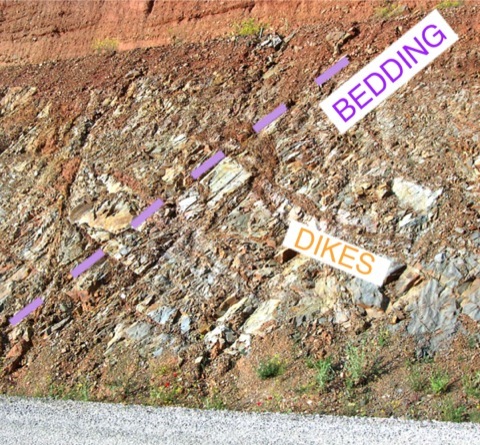 Note that the dominant set of dikes is cutting sharply across the bedding (see Fig. 6). In the top: Unfolded post-impact Tertiary sediments. Fig. 6. Segment of the wall in Fig. 5. Fig. 7. For comparison: System of impact breccia dikes cutting sharply through Paleozoic silicate rocks. Autovía Mudéjar in course of construction; near Cariñena (2 in Fig. 2). Azuara impact structure. Fig. 1. 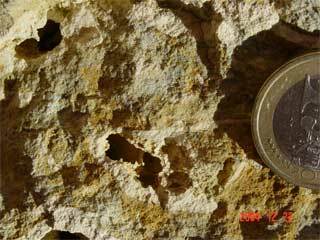 Amazingly similar: Regmaglypts on the surface of the Tabor meteorite and on a limestone clast from the Puerto Mínguez impact ejecta. 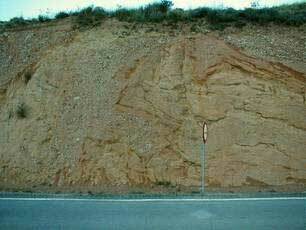 Among the various deformation features exhibited by the carbonate clasts in the Puerto Mínguez ejecta deposit (striae, nail prints, grooves, rotated fractures, irregular fractures with complex bifurcations, mirror polish, etc), regmaglypted clast surfaces are a prominent feature (Fig. 1). For the first time described by K. Ernstson (2004), they establish clear evidences of an aerial transport of quite a few clasts of the ejecta. Fig. 2. 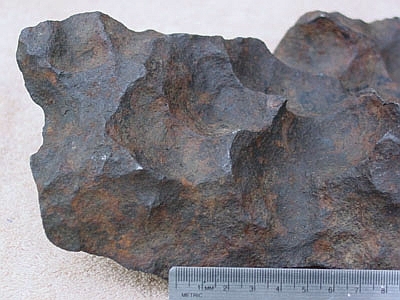 A Gibeon meteorite exhibiting distinct regmaglypts. 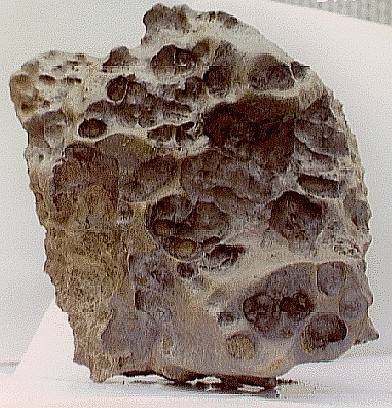 Regmaglypts (or thumbprints) are reliefs commonly reported for the surface of some meteorites (Figs. 1, 2). The depressions originate from dynamic air pressure [continue …] and from selective erosion by material melting (ablation) off the surface of the meteorite on its passage through the atmosphere. The relief may show polygonal, spherical, rounded or elliptical shape, and a pattern like fingers over wet clay is frequent. We suggest the ablation features observed in the ejecta have originated from a similar process that is carbonate melting and ablation off the surface on the passage of the ejecta clasts through the heated impact explosion cloud. Of course, the depressions on the Puerto Mínguez clasts in a way remind of lapiés (karren) features on surfaces of exposed limestones. Lapiés consist of shallow, straight grooves or runnels incised into the limestone by solution. Because of the striae and polish regularly coating the regmaglypted surfaces, and because the regmaglyptic clasts are embedded as individuals in the ejecta matrix (Fig. 3), an in situ formation as lapiés can clearly be excluded. Fig. 3. The regmaglypted individual embedded in the Puerto Mínguez impact ejecta is incompatible with an in situ dissolution (“lapiés” formation). Alternatively, the “lapiés” depressions existed already before the impact and survived rock fracturing, excavation, and emplacement of the ejecta. This can be excluded because many clasts are regmaglypted all around (Fig. 4), and the frequently observed sharp-edged ridges of the regmaglypts (Fig. 4) would not have survived the excavation and ejection process. Fig. 4. 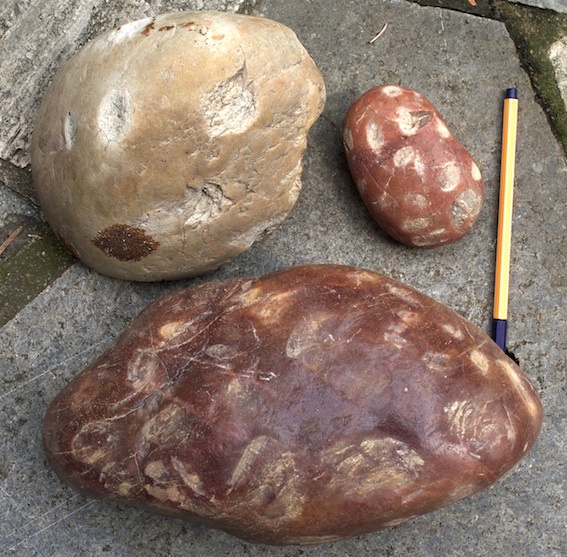 Front and rear of a regmaglypted limestone clast from the Puerto Mínguez ejecta. 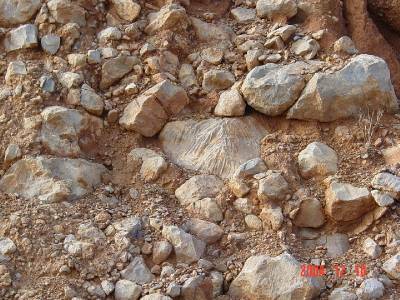 The regmaglypts all around and the sharp ridges exclude a “lapiés” formation before excavation and ejection. 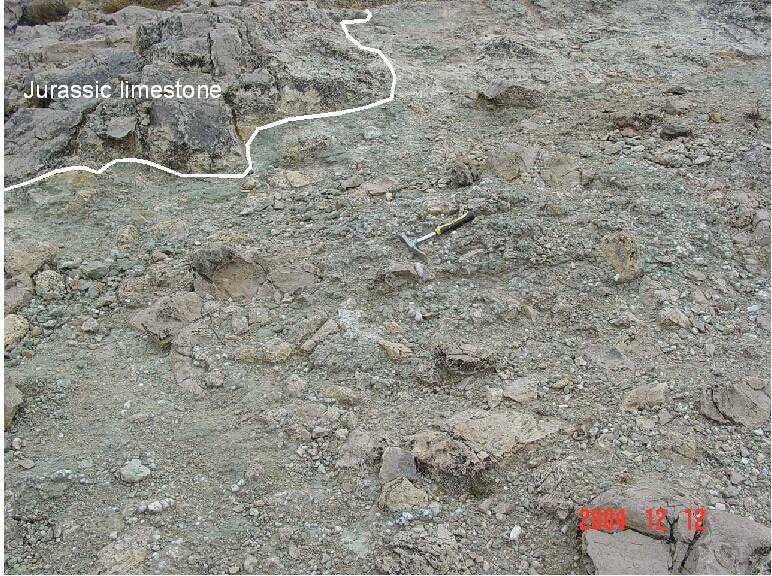 In a few cases, the ablation by obvious carbonate melting of the clasts has eaten deeply into the clast (Fig. 5) reminding of similar distinct ablation features of some meteorites (Fig. 6). Fig. 5. A regmaglypted limestone clast from the Puerto Mínguez ejecta exhibits prominent ablation reaching deeply inside into the limestone clast. For comparison see the meteoritic ablation features in Fig. 6. Fig. 6. The Derrick Peak, Antarctica, meteorite. Image courtesy of NASA. An extended article on the Puerto Mínguez regmaglypted ejecta including many images can be read here. 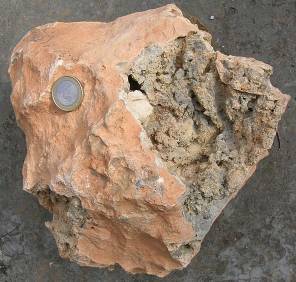 Impact-affected limestone clasts with regmaglypts have been reported also from the Chiemgau impact. An article may be clicked. 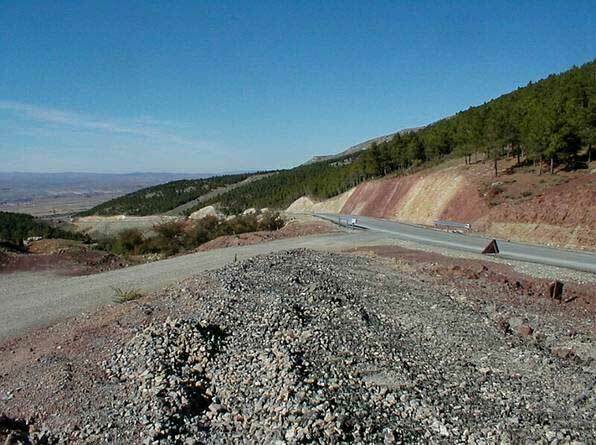 Road constructors are the friends of the impact geologists. 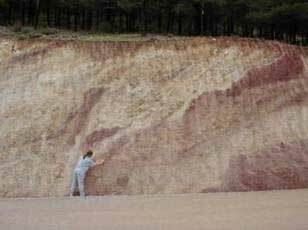 Without their work, most of the highlighting impact outcrops in the Spanish Azuara and Rubielos de la Cérida impact structures would not exist, and many of the rocks typifying impact would not have been discovered. 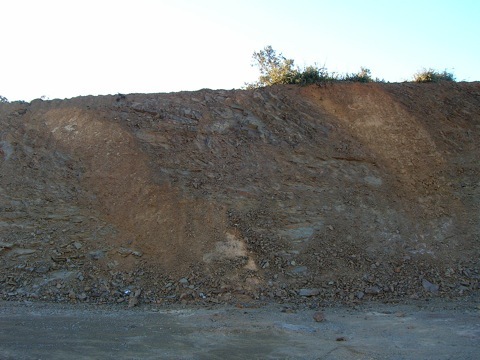 In the last decade, kilometers and kilometers of new geological exposures have been prepared, and we mention the road cuts between Luco de Jiloca and Lechago, at the Puerto Mínguez, between Navarrete and Barrachina, between Fuendetodos and Azuara, between Lécera and Muniesa, between Fuendetodos and Jaulín, and many more. 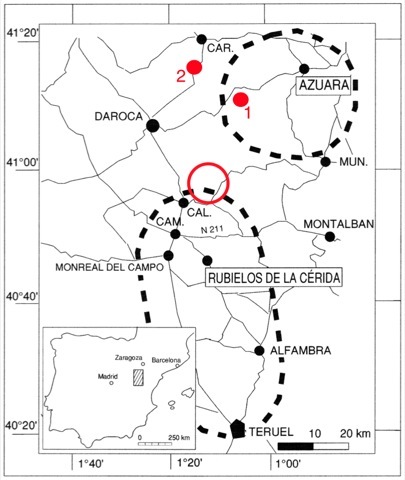 Not only the road cuts but also the many new quarries mostly exploited for road construction material have supplied new geologic outcrops of high geologic importance, as for example the quarries between Belchite and Puebla de Albortón, the many temporary quarries between Navarrete and Barrachina, the large quarries of Corbalán, San Blas, Villafranca del Campo, near Muel, and so on. The road cut at the crater rim and view down into the Rubielos de la Cérida impact basin. 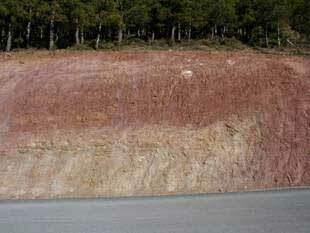 Only recently, the new road cutting into the Rubielos de la Cérida impact basin rim in the ascent between Alfambra/Escorihuela and El Pobo/Cedrillas has prepared a breath-taking extraordinary continuous geologic exposure of currently about 2 km length. 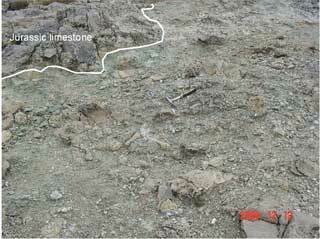 The exposure does not show only the unimaginably disastrous forces of the impact excavation and modification of the Permotriassic/Buntsandstein and Muschelkalk rocks leaving a gigantic megabreccia, but also reveals large-scale rock deformations hitherto obviously unknown to geologists. We want to call them stop-and-go deformations. 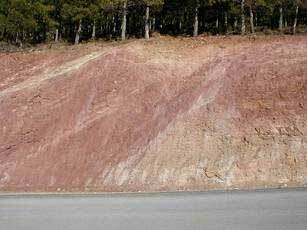 The impact stop-and-go deformation is characterized by a multiple rapid sequence of erosion, sedimentation, folding, faulting and flow in a limited rock unit. This extremely peculiar process is not explicable by “normal“ geological forces and is understood only by the complex impact excavation and modification movements with permanently and in a short time strongly varying stress fields probably supported by the action of water and shock-produced volatiles. Simple model of stop-and go deformation. More stop-and-go deformations: megabreccia near Barrachina. 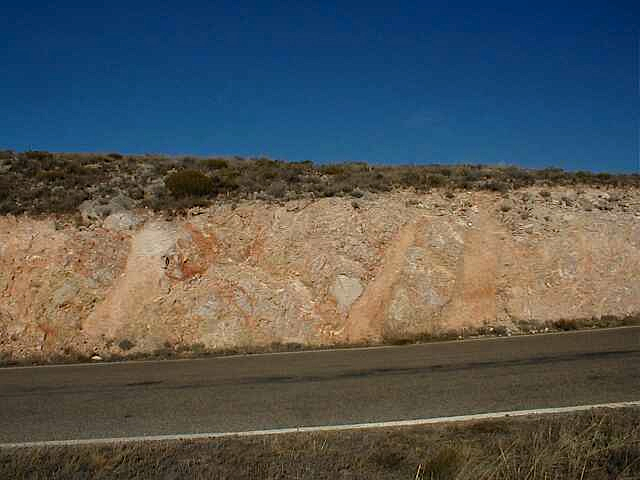 About 30 km north of the center of the Azuara impact structure (Spain) near the village of Jaulín (0°59.3′ W; 41°27.2′ N), a peculiar breccia is exposed. The breccia, not mapped geologically thus far, is intercalated between fossil-rich Jurassic limestones and brownish Miocene(?) 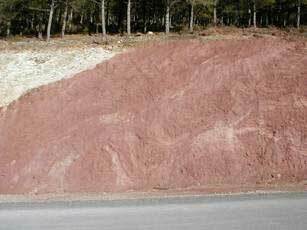 gypsum marls. 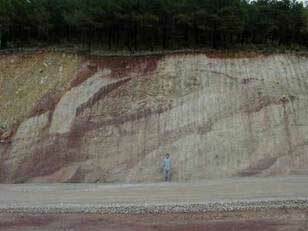 The breccia is unconformably overlying the Mesozoic rocks (Fig. 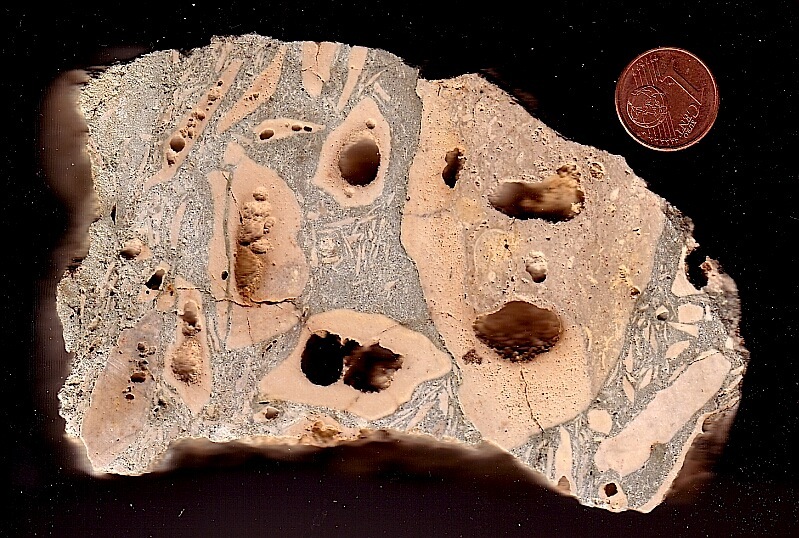 1) and may penetrate the limestones (breccia dikes, Fig. 2) as well as corrode them (Fig. 3). Fig.1. 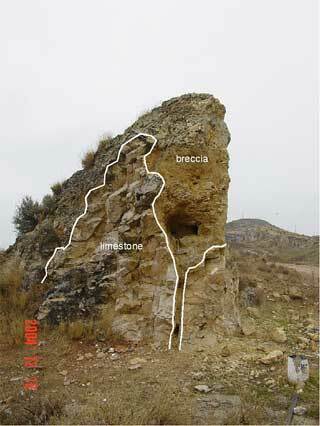 Unconformable contact between the Jaulín breccia and the Jurassic limestones. Fig. 2. Penetration of the breccia into the Jurassic host rock in the form of a dike. Fig.3. 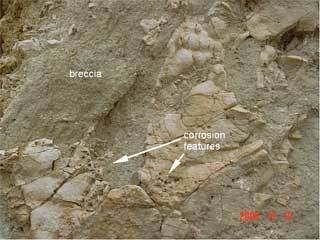 Corrosion features in the contact zone between breccia and host rock. Neither aeolian nor karstification processes are responsible of the corrosion, which probably is related with decarbonization. On cursory inspection, the greenish rock looks like a massive bone breccia (Fig. 4). 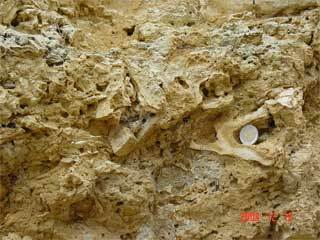 On closer examination, the “bones” prove to be limestone clasts having become hollow or more or less completely skeletal (Figs.5, 6). Fig. 4. At first glance, the breccia reminds of a massive bone breccia. Fig. 5. Close-up of the carbonate breccia clasts. Fig. 6. Close-up of hollow and skeletal clasts embedded in the matrix. Note that the decomposition with possible relics of carbonate melt is confined to the interior of the cobbles reminding of the construction of a wasp’s nest. Beginning (Fig. 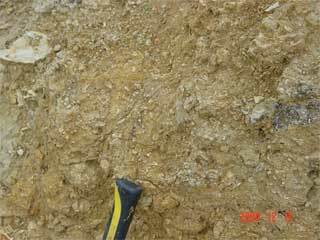 7) and complete fragmentation of the clasts is observed. 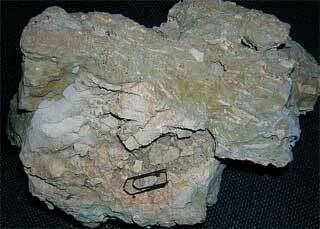 Beside these decomposed clasts, fragments of the limestone host rock are intermixed in the breccia (Fig. 8). They frequently show distinct whitish rims (Fig. 9) which we interpret as the result of beginning decarbonization from enhanced temperatures. 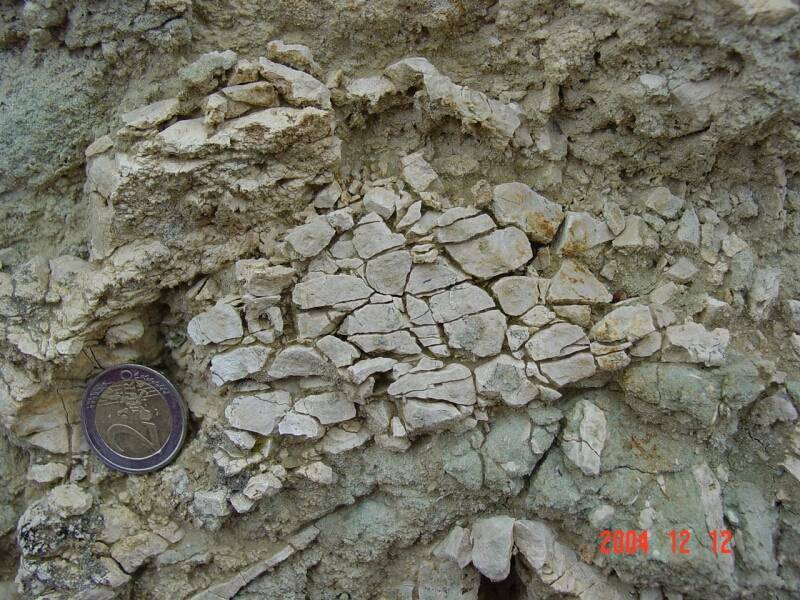 Occasionally, the fragmented clasts remain coherent giving evidence of confining pressure upon emplacement (Fig. 10). For the present, it is not clear whether the hollow and skeletal clasts originate also from the local limestones, but from the discussion below we have to assume they are allochthonous. Fig. 7. 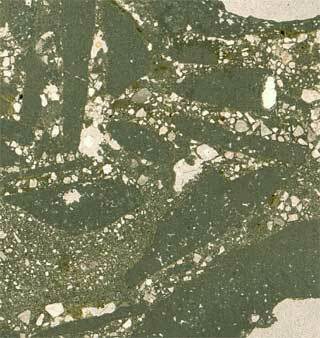 Breccia sample exhibiting a decomposed, fragmented clast and distinct flow texture of the matrix. Fig. 8. 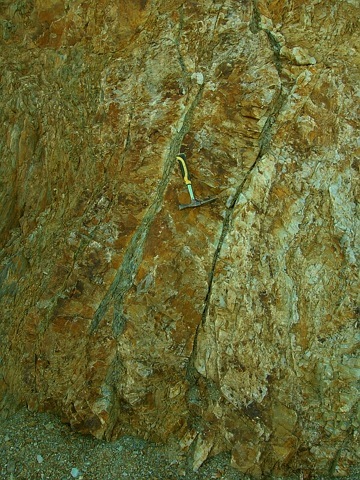 Evidence for the erosive strength of the breccia emplacement process: fragments of the limestone host rock have been carried away and embedded in the greenish matrix. Note the beginning “conglomeratization” (increasing roundness) of the clasts. Fig. 9. Whitish rims of limestone fragments in contact with the breccia matrix: evidence of beginning decarbonization due to enhanced temperatures. Fig. 10. 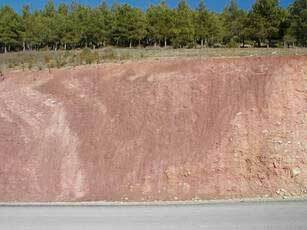 Fragmented but coherent limestone clast as indicative of confining pressure during the emplacement. 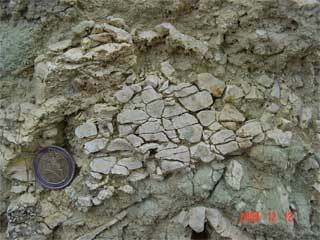 The clasts are immersed in a greenish matrix (Fig. 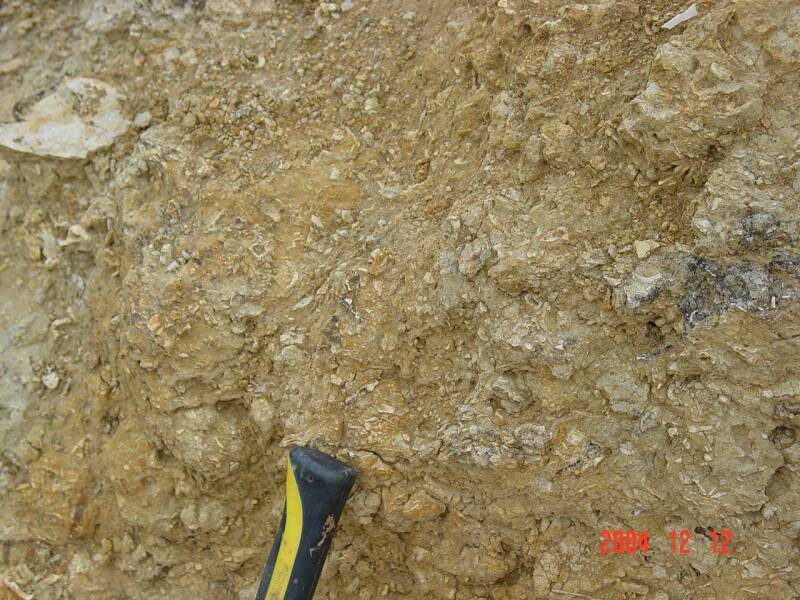 8) partly exhibiting flow texture as indicated by lined-up small elongated clasts (Fig. 7). In thin section (Fig. 11), the matrix shows to be fine-grained carbonate streaked with irregular bands of poorly rounded quartz grains in a slightly different matrix. 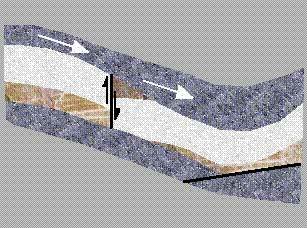 Quite a few quartz grains exhibit planar deformation features (PDFs) as in proof of shock metamorphism (Fig. 12). Fig. 11. Breccia matrix composed of dark carbonate material streaked with irregular bands of poorly rounded quartz grains in a slightly different matrix. Photomicrograph, plane light; the field is 10 mm wide. Fig. 12. 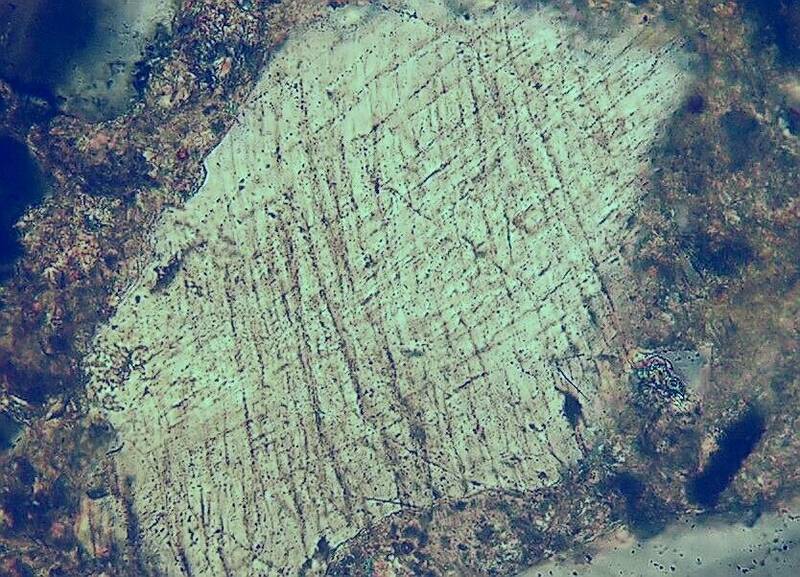 Several sets of decorated planar deformation features (PDFs) in a quartz grain from the breccia matrix. Photomicrograph, crossed polarizers; the field is 220 µm wide. Breccia formation. 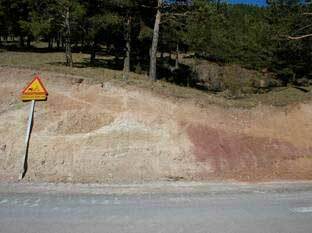 – The contacts between breccia and underlying autochthonous rocks as well as the peculiar characteristics of the clasts absolutely exclude a karstification process. A “normal” sedimentation and any diagenetic processes are not consistent with the observations either. From the stratigraphic position at the base of the unfolded Upper Tertiary and from the evidence of enhanced temperatures and of shock metamorphism we conclude the breccia to be an impactite related with the formation of the Azuara structure in the giant multiple impact event that, beside the Azuara structure, formed also the large Rubielos de la Cérida impact basin and crater chain (see http://www.impact-structures.com/spain/). We explain the breccia to be impact ejecta excavated from a region in the Azuara structure where shock intensities were enough to decarbonize and melt limestone cobbles and boulders and to produce PDFs in quartz grains contributing to the breccia matrix. Fig. 13. Breccia sample impressively exhibiting internally corroded limestone clasts. Also note the finely splintered components. a shock heating of the cobbles and a rapid external cooling upon ejection, only allowing the interior to be decarbonized and melted. On excavation and ejection, the shocked limestone clasts were mixed with the greenish matrix material possibly originating also from the Lower Tertiary. The emplacement was a process of ballistic erosion and sedimentation (Oberbeck 1975) under high pressure (penetration into the Jurassic host rock that was partially fragmented and incorporated into the breccia) and still enhanced temperatures (partial decarbonization of the host rock). With regard to its stratigraphical position, the Jaulín impactite must be seen as a special variety of the Azuara/Rubielos de la Cérida basal breccia, and, due to the observed shock effects and the relics of probable carbonate melt, as a special type of a suevite breccia (see IUGS classification, the_suevite_page).